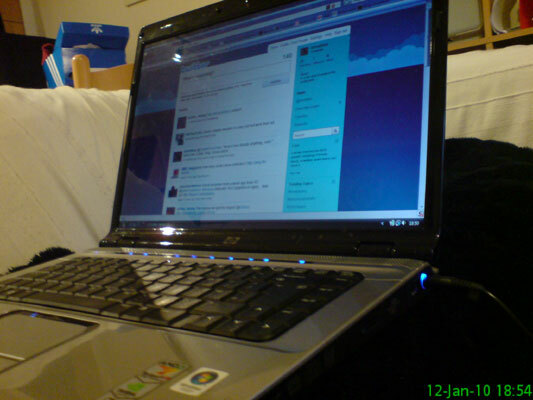 Listening to Radio Leipzig. Which basically plays English music. Ali & Carolyn browsing the map in Baby Lynch. With half price drinks and free shots. Paula, Kevin, Joanne and Martin. 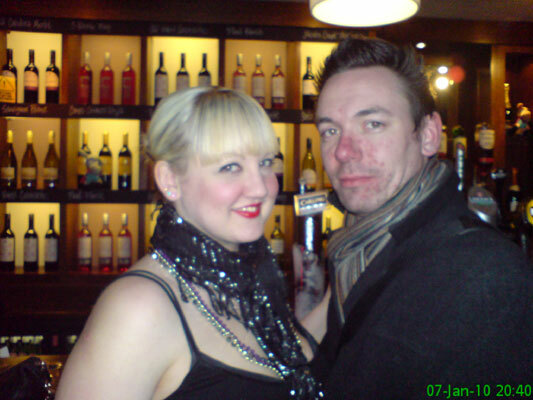 Taken to prove Martin & Paula still exist, as they are now retired from clubbing. New purchase! 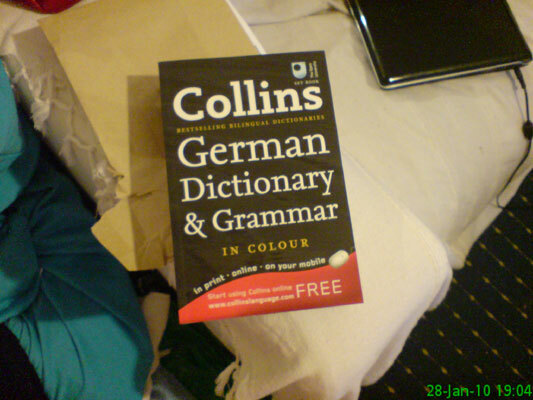 The colour aspect was a let down.. basically the words are in blue. 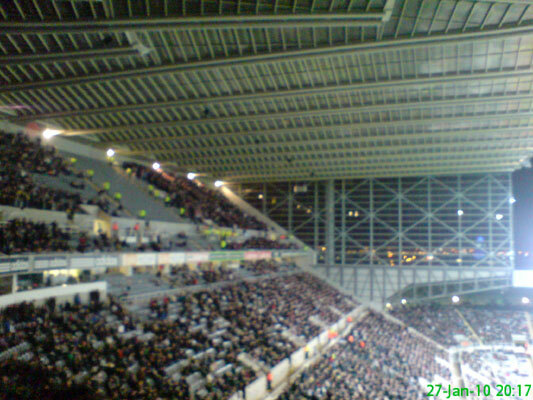 The faithful Crystal Palace fans who turned up for the match shortly after their team went into administration. Chopping what can only be described as a ridiculous amount of carrots. 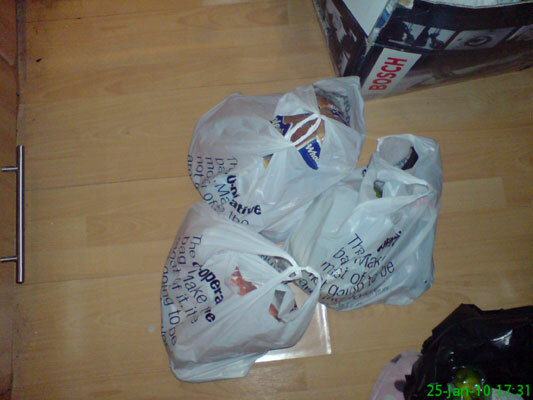 The Co-op is where 90% of my pet hates originate. But I needed food.. Went to a Wedding Fayre with Mam & Ali. 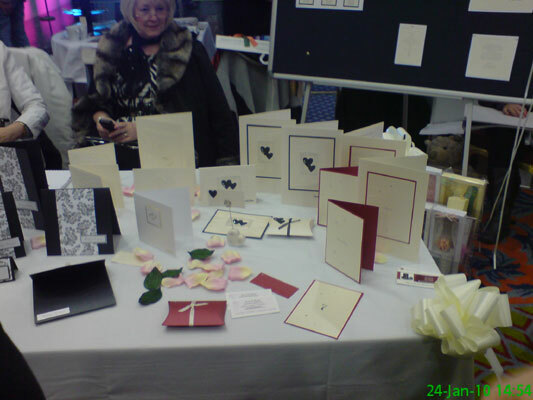 This was one of many displays of invitation styles. 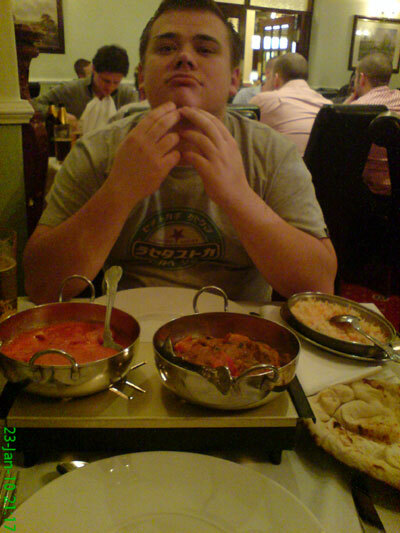 Had a very tasty curry at Latif's. Michael had Fear, Mak and James round to take advantage of Dominos 50% off vouchers. 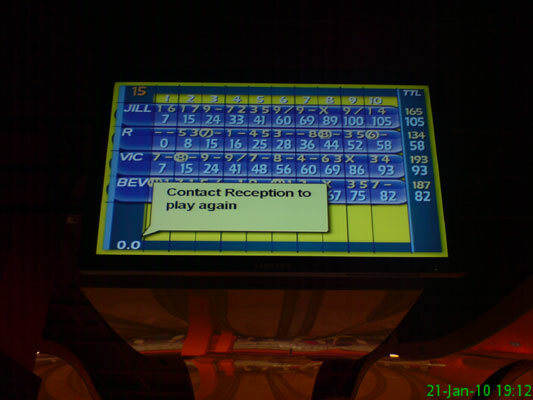 We went bowling and despite having a horrendous first game, I managed to win the second. 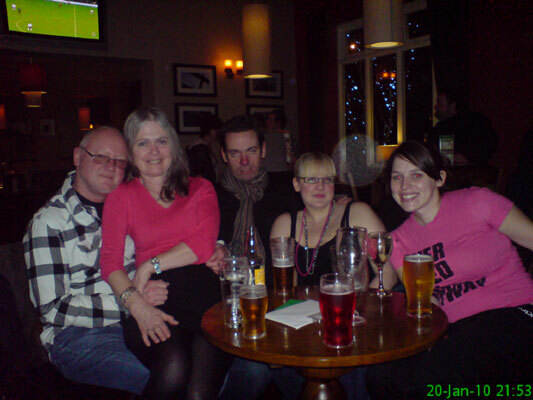 Drinks at the Newton: Dad, Steph, Stu, Ali & Katy. 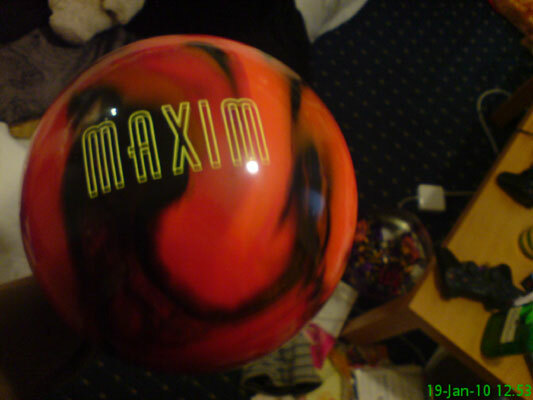 This was taken to prove to my work colleagues that I am sad enough to own a bowling ball. Its name, according to the box, is Captain Fireball. 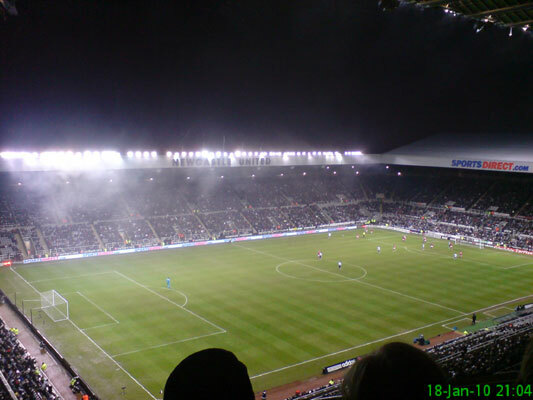 The fog rolling down towards the pitch seconds before Peter Lovenkrands scored to make it 2-2 just days after the death of his father. 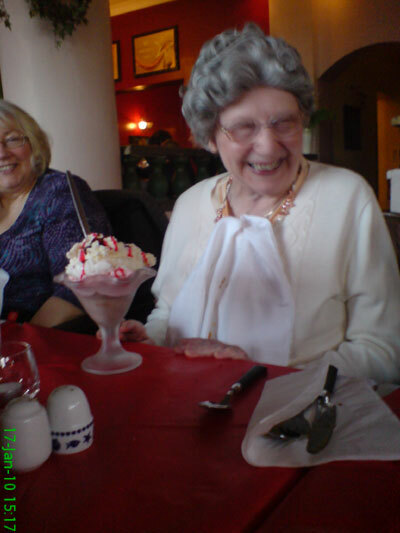 Went for a meal at Amici for Gran's birthday - she was the only one brave enough to tackle a dessert. 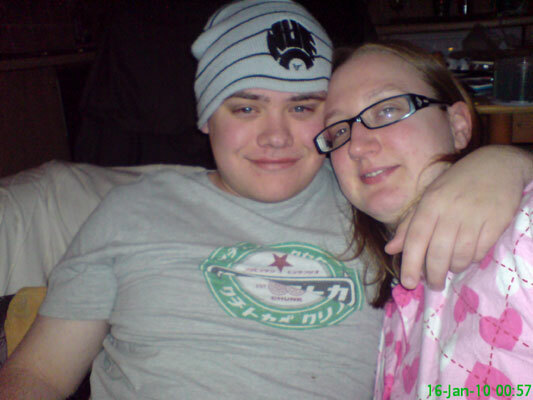 Slightly tipsy with my comfy pyjamas on, and Michael in his hat. 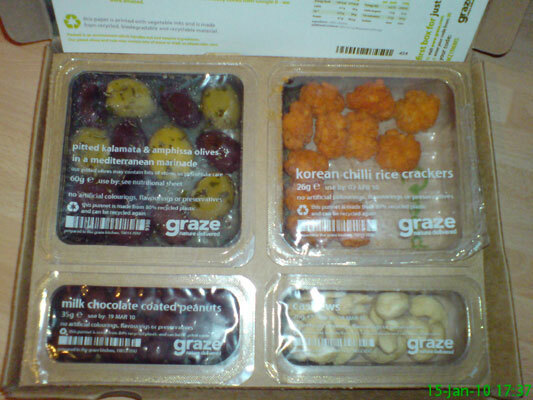 My first (and free) batch of snacks from Graze.com. Those Korean chilli rice crackers are amazing. 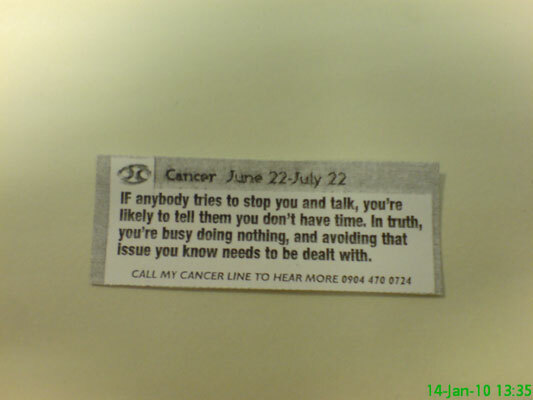 Worryingly accurate for me today. I spend a lot of my time doing nothing, and putting off things that need doing. 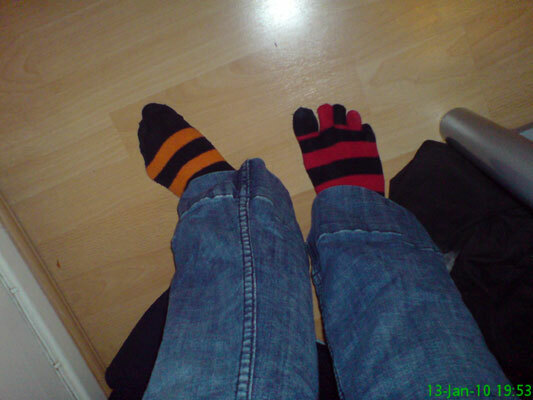 Went out to the pub, so took a leaf out of Mr Witton's book and tried a combination of socks. So here's a photo for sock fans..
Another sick day - messed around on Twitter for a bit. 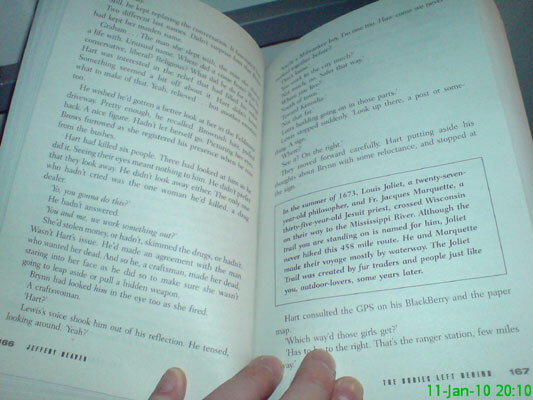 Off sick - boring day - read a book (The Bodies Left Behind by Jeffery Deaver). Not his best work. 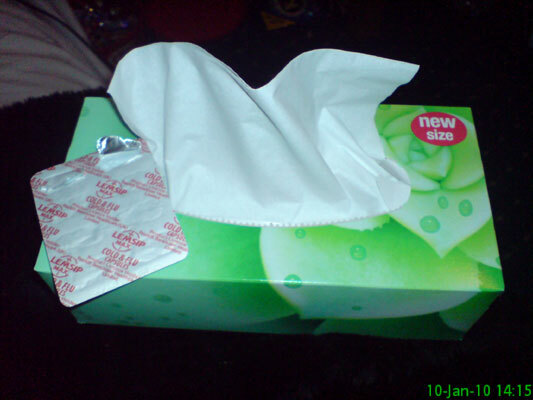 Got a rotten cold so today was spent mostly in the company of tissues and Lemsip capsules. We had a party to celebrate Stu turning 30 and Stu & Ali's recent-ish engagement. 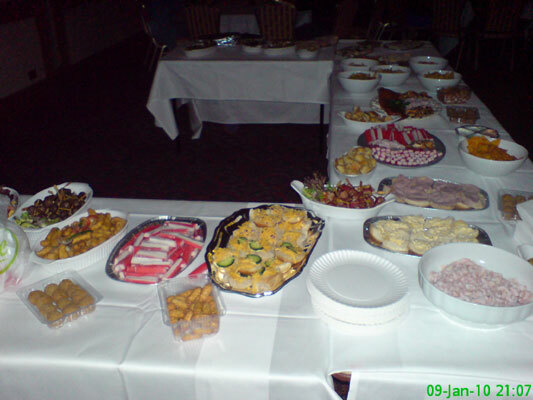 I was on buffet duty (well ok, sandwiches). 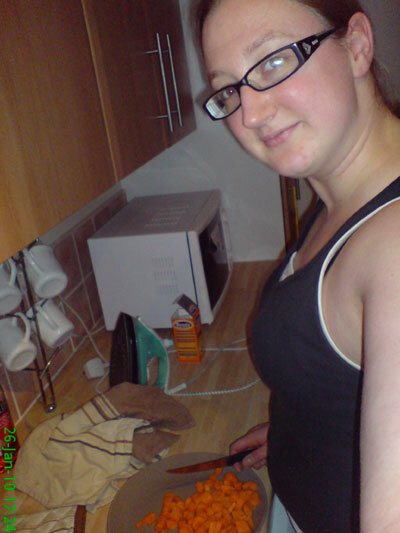 I was also on photo duty; thankfully most were better than this. 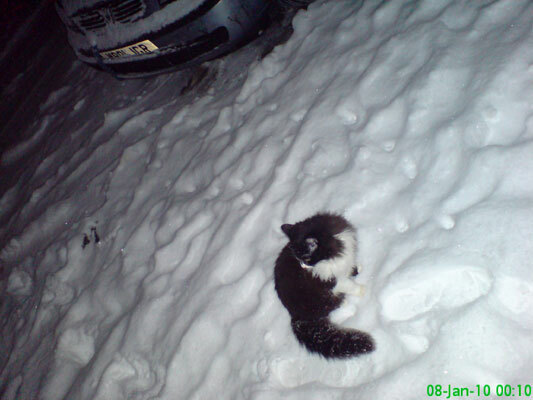 A random cat left out in the snow. It tried to get into Ali's house and I nearly shut its head in the door. It was an accident, I swear. Ali & Stu at the Newton on Stu's 30th birthday. 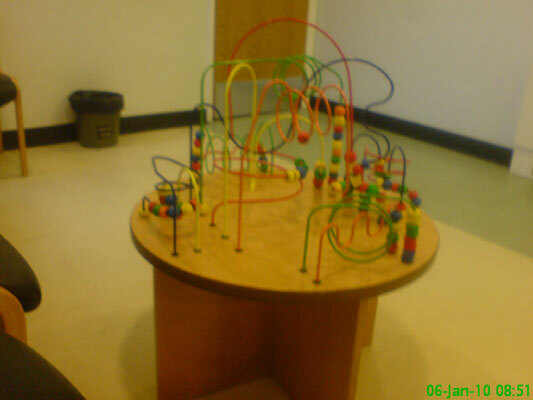 This is what greeted me at Newcastle General Hospital when I went for an EMG test. No carpal tunnel for me though! 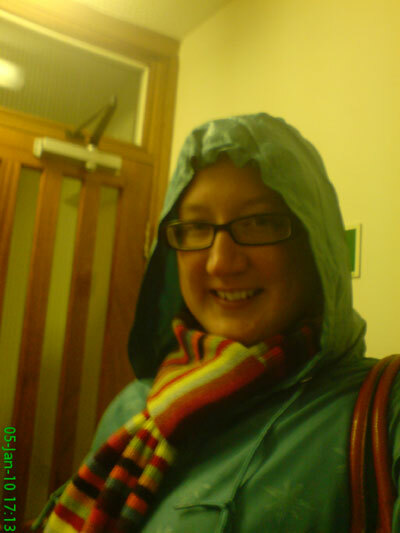 Arriving home from work on a cold and snowy day, sporting a beautiful scarf. 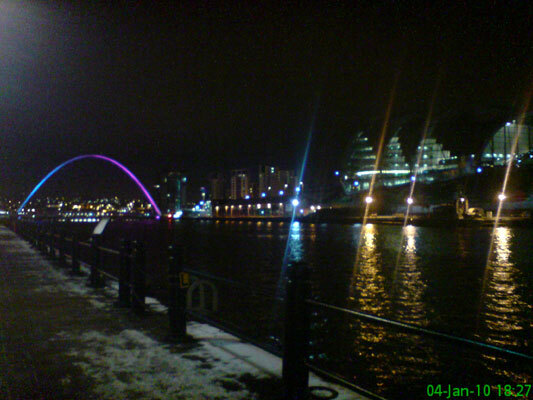 Hopefully one of many strolls along Newcastle Quayside this year. It was freezing cold, and the quality of the photo doesn't do the view justice. 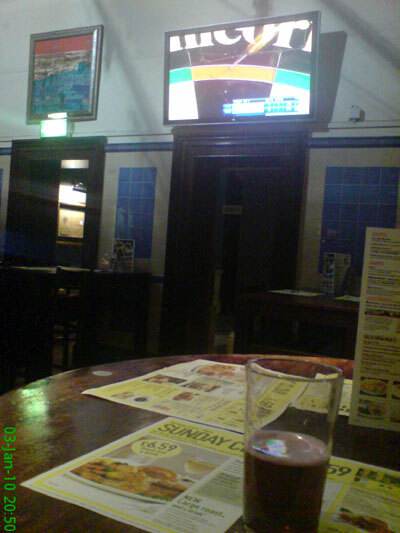 Watched the PDC World Darts Championship final in Union Rooms with a few pints of Strongbow & black. Taylor beat Whitlock. 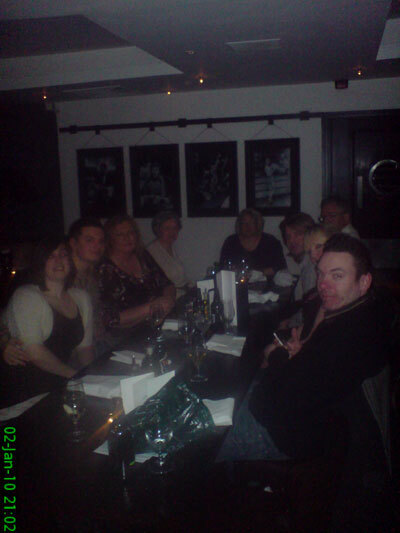 The family went for a meal at Gusto to celebrate Nasser's 24th birthday. 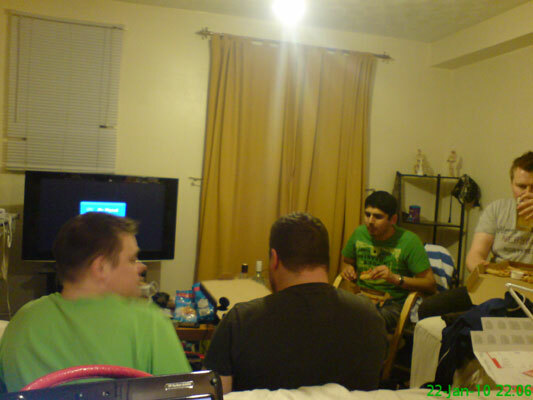 Clockwise from left: Sophie, Nass, Sue, Mam, Chris (leaning back), Rob (leaning forwards), Ali, Stu. The good thing about taking the photos is that I don't have to be in them. 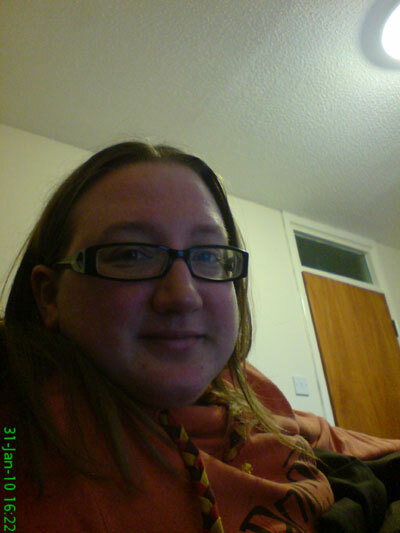 Shame it's a terrible photo, but I could only be bothered with the one attempt. 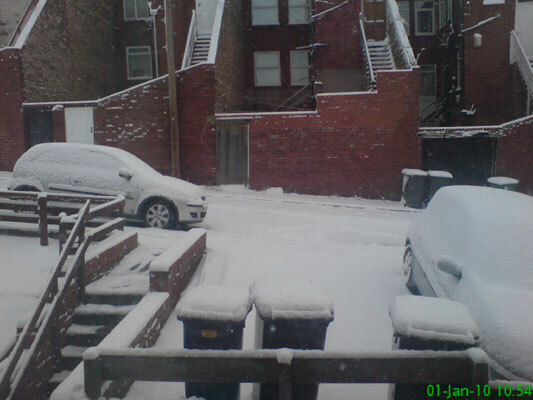 Woke up to a beautiful layer of snow on New Years Day. The walk home was not quite as pleasant.